We bring you tips for making a financial plan so that you can lead a stress-free life. 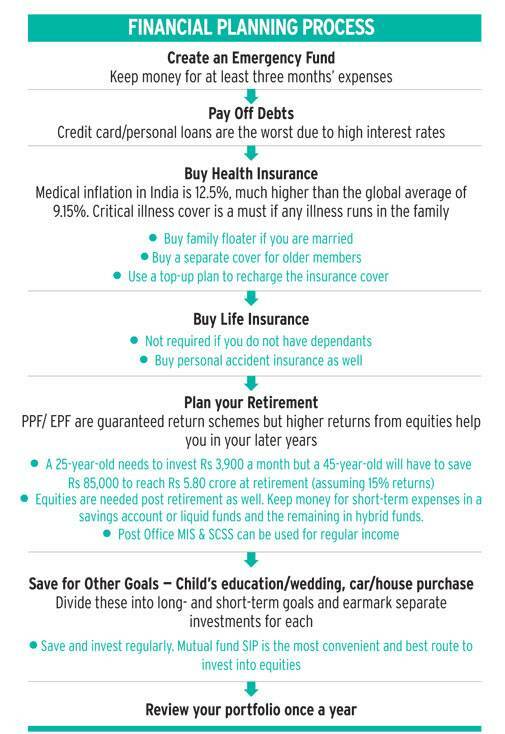 That Indian urban consumers do little about securing their financial future is a well-established fact. For instance, a recent study by HDFC Life and Value Notes pegged The Indian Urban Consumer's Financial Planning Index at 62.7 on a scale of 100, which is quite low. Just like any event - be it a family function or an office party - where leaving things unattended creates a mess, ignoring financial planning can have consequences for your future well-being and peace of mind. "What if you die tomorrow? What if you fall sick and have to spend a lot on your treatment? What if you lose your job? These things can happen to anybody," says Vidya Bala, Head, Mutual Fund Research, FundsIndia.com. "Financial planning cushions you from these shocks and ensures that you have a road/direction to fulfil your goals and aspirations. It also ensures that your family continues to be financially secure in your absence," she says. It also helps you prioritise goals. "Financial planning gives you clarity on what you want your money to do for you," says Shweta Jain, COO, International Money Matters, a Sebi-registered investment advisor. Though most of us understand the need to make and follow a financial plan, we do not know where to start. The journey, say experts, begins with getting the basics right. The future is uncertain. That's why the first step in financial planning in building a fund for emergencies. "Before investing, save for at least three to six months' expenses for emergencies," says Sushil Jain, National Head, Financial Planning, Bajaj Capital. If you have small children or old parents, save even more. This fund should be easy to access and so should ideally be parked in a savings account with ATM withdrawal facility. Banks offer 4-6 per cent interest on savings deposits. 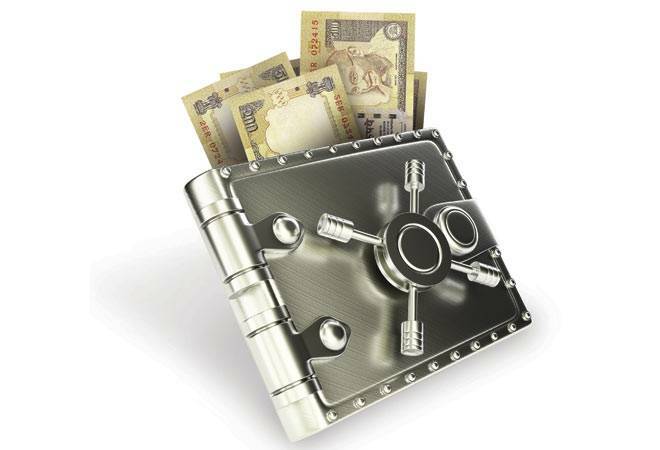 You may also opt for the auto sweep-in facility provided by banks wherein money above a certain limit is transferred to a fixed deposit that pays a higher rate of interest. If the balance falls below the agreed threshold, that money is transferred back to the savings account. This gives the benefit of both fixed deposit and savings account. Do not expose the contingency fund to too much risk. Emergency money can also be parked in liquid funds, which invest in securities with residual maturity of less than or equal to 91 days such as money market instruments and short-term corporate deposits. These funds, on average, gave a one-year return of 7.77 per cent as on September 12, 2016, much more than the savings account. In case of redemption, you get the money in just one business day. The next step should be paying off loans that have a high rate of interest and do not create any value. Examples include credit card dues/loans and personal loans. The interest rate on a credit card loan can go up to 40 per cent per annum. Personal loans, at 16-18 per cent, are also expensive. There is no investment that can give you such high returns. So, it is best to get rid of such loans before moving further. However, student and home loans create value. The latter also helps you save a lot of tax. These are the good loans that you can go easy on. "It is advisable to pay off your liabilities to get peace of mind. But find out the advantages & disadvantages of doing so. For example, if you have a car loan on which the interest rate is 11 per cent, you should repay it and start investing the money that you save every month. But if you have a housing loan, it is better to continue it, as it gives tax benefits under Section 80C and Section 24 of the Income Tax Act. The total deduction under these two Sections is Rs 3.5 lakh," says Jain of Bajaj Capital. Health Insurance: According to Aon Hewitt's Global Medical Trend Rates 2016, India's medical inflation is 12.5 per cent, much higher than the global average of 9.15 per cent. No debt investment will pay you more than this. So, once you have started paying your loans, you must buy protection from hefty medical bills. "Health insurance will protect your finances in case of a medical emergency. Otherwise, hospital bills may eat up all your savings," says Jain of Bajaj Capital. Calculate how much sum insured is enough for you and your family based on your lifestyle, health and family medical history. Buy a policy that offers lifetime renewal and has no sub-limit or co-payment (under which you pay a part of the bill) clauses. Lifetime renewal is a must as you may be unable to buy health insurance once you get old. Even if some insurer sells you a policy in old age, it will cost a bomb, and will have several exclusions and conditions. Also, go through the list of exclusions. Most insurers cover existing illnesses after four years. Some illnesses might be covered only after a waiting period whereas some, such as HIV/AIDS, might not be covered at all. Choose a family floater if you are married. Buy a separate cover for parents as they are more likely to fall ill and so exhaust the sum insured. As your responsibilities grow, you might need a higher cover. For this, purchase a top-up health plan. It is a regular indemnity policy that covers medical expenses after a threshold, fixed at the time of purchase, is breached. For instance, a top-up policy with a Rs 3 lakh threshold will kick in after the medical bill crosses this limit. "Top-up plans are a stepney to your main health reimbursement policy. A regular policy reimburses bills up to the sum insured while a top-up pays after the threshold is reached. It is an additional cover for those already covered," says Jatin Khemani, Founder & Managing Director, Stalwart Advisors, a Sebi-registered investment advisor. Top-up plans are cheaper than basic health plans. For instance, if a 30-year-old wishes to increase his/her cover by Rs 5 lakh, a basic health policy will cost Rs 5,900-7,000 per year. A Rs 5 lakh super top-up policy with a Rs 3 lakh threshold will cost around Rs 2,800. If your family has a history of some illness, buy a critical illness plan too. These plans pay a fixed sum upon confirmed diagnoses of the covered illness. Life Insurance: A life insurance policy pays family members in the event of the insured person's demise. Term insurance is the cheapest insurance cover. However, you can give it a pass if you do not have dependents. "Children and retirees, who don't have an income to protect, don't require life insurance," says Manik Nangia, Director & Head of Product Management, Max Life Insurance. To ensure that your family gets enough money to replace your income in case of your demise, opt for a high sum assured. Avoid thumb rules. Calculate the sum yourself based on your needs. Sit with pen and paper or open an excel sheet to do the calculations (see Calculating Human Life Value). Consider the rise in prices while calculating day-to-day expenses and goal amounts. It is better to buy a slightly bigger cover than remain underinsured. Also, buy a personal accident disability cover, which will pay a fixed sum if you are unable to work due to a mishap. Now, decide whether you wish to buy these policies online or offline. While online policies are cheaper, you may not get the option if you have a chronic illness or are older than 45 or 50 years. The insurer might ask you to go through medical check-ups before agreeing to cover you. Some people hide their medical conditions to save on premium. This must be strictly avoided as the insurer might reject your claim if it finds out about this later. Make full disclosures. You need to plan well if you want to live post-retirement years the way you are living while earning. "We can take loans for all goals except retirement. So, start early to enjoy the benefit of compounding," says Jain of Bajaj Capital. You also need to make sure that your savings grow fast enough to beat inflation. 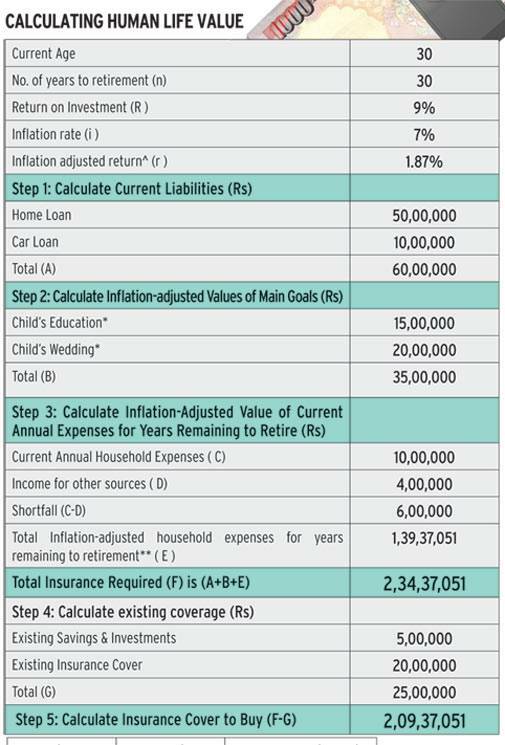 If your present annual expense is Rs 6 lakh, after 30 years, you will need Rs 45.7 lakh a year, assuming 7 per cent inflation. Of course, your everyday expenses will be lower after you retire, though medical expenses may be higher. The earlier you start, the lesser you will need to save. Take an example. 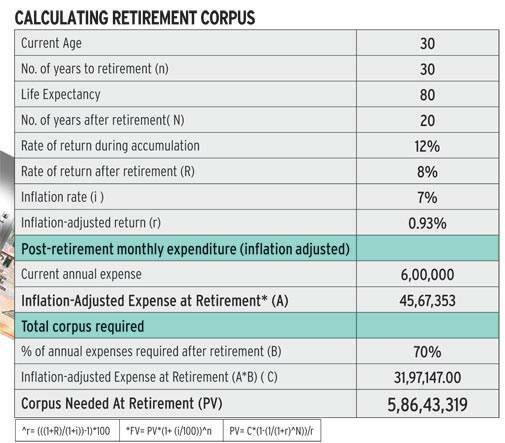 If you feel that you will need 70 per cent of current annual expenses (Rs 6 lakh) after retirement, you will have to save Rs 5.8 crore assuming you live for 20 more years after retirement and the rate of return on your investments after retirement is 8 per cent (see Calculating Retirement Corpus). To build a retirement fund of Rs 5.8 crore, a 25-year-old will have to save Rs 3,900 a month whereas a 45-year-old will have to save Rs 85,000 per month. We have assumed 15 per cent returns (see Start Early to Save Easily). Invest regularly through mutual fund systematic investment plans or SIPs. Public provident fund (PPF), employee provident fund (EPF) and bank fixed deposits are some popular guaranteed return schemes to save for retirement. The PPF maturity period is 15 years. It can be extended by five years. Premature withdrawals are allowed after seven years of the opening of the account. The PPF is right now giving 8.10 per cent returns. But returns from these schemes may or may not beat inflation. That is why one must also invest in market-linked schemes such as National Pension System (NPS) and mutual funds. NPS allows up to 50 per cent exposure to equities. There is also an option to choose equity and debt allocations. Unit-linked investment plans, sold as retirement plans, are best avoided due to high charges/fees. After retirement, you will need stability and regular income. You will also need some growth in the accumulated funds to beat inflation for which some exposure to equities, preferably through mutual funds, can be taken. Your money cannot take a back seat and rest. It has to work hard till life. You must continue to maintain the emergency fund. Revisit your health insurance needs. "If you have sufficient monthly cash flow through pension or rental income, keep your funds in Post Office Senior Citizens' Savings Scheme, bank/corporate deposits and a good chunk in debt funds," says Bala of FundsIndia.com. Post Office Monthly Income Scheme (POMIS) and Senior Citizens' Savings Scheme (SCSS) have a five-year lock-in. While one can invest up to Rs 4.5 lakh in the POMIS, in SCSS the maximum one can invest is Rs 15 lakh. These investments can be used to get regular income. "If you are dependent on your post-retirement corpus for income, split it between Post Office Senior Citizens' Scheme, some bank deposits and low-risk debt funds. Use a systematic withdrawal plan to take out a fixed sum every month. Mutual funds are far more tax efficient and deliver better post-tax returns," says Bala. Now, you may concentrate on other goals. You might want to renovate your house, go on a foreign vacation or buy a car or a house. You might also have certain non-negotiable goals such as your child's higher education or wedding. Sit with pen and paper or an excel sheet to note down your goals, time to reach them and amounts that you will need for each goal. The goals should be realistic. Calculate inflation-adjusted cost for each and how much you need to save to accomplish them. Have separate investments for different goals (see Goals: How Much to Invest). Your debt-equity allocation must depend on your risk appetite. The more time you have, the higher can be your allocation to equities. 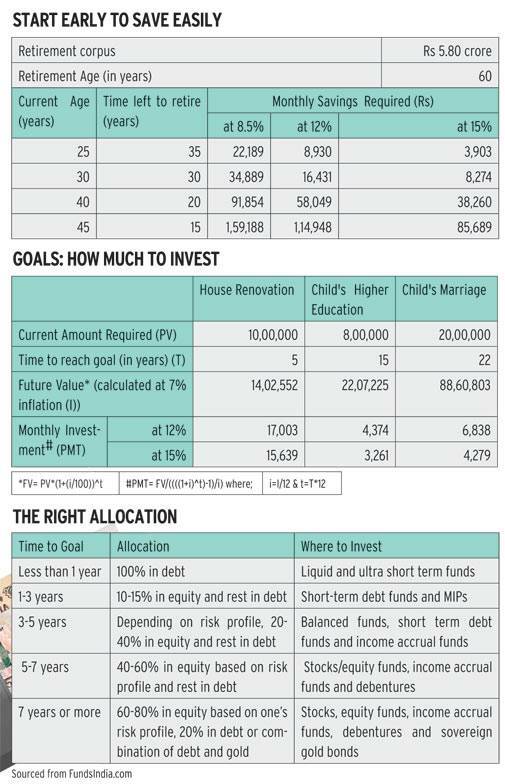 SIP is the best way to invest in equity mutual funds. It averages out costs as well as risks. For goals coming up in three or less years, invest in debt. "When a goal is approaching, move to debt so that the capital is not at risk and volatility is reduced," says Jain of International Money Matters. Changing needs require you to revisit your financial plan and make adjustments. You must review your portfolio once a year. A bad financial plan is equivalent to not having a financial plan at all. If you cannot do it yourself, hire a Sebi-registered financial planner.